Do you have the skills to become a volunteer in the Reading Rooms? Could you spare some time and work as a volunteer in the Reading Rooms at the Verbal Arts Centre? Reading Rooms is a successful shared reading programme developed and managed by the Verbal Arts Centre. 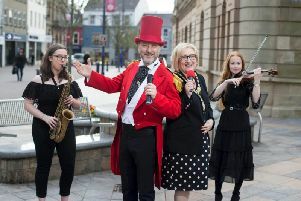 The format is inclusive and it is backed by a range of statutory, charitable, and discretionary funders, including Arts Council NI, the Henry Smith Charity, Children in Need, and Spirit of 2012.
experiences, and the transformations that occur within groups are nothing short of amazing. Reading Rooms has improved confidence, literacy, self-esteem, and decision-making across the board. Outreach Project Officer, Aoife Logue, takes up the story: WWe could not fulfil our commitment to Reading Rooms without a dedicated team of volunteers, and we are lucky to have some of the most committed volunteers in the business working with us. It is a big ask. Volunteers need to be available to commit themselves to the programme, to collect and prepare their materials, to get to their venues and deliver the Reading Rooms every week, and to provide specific feedback on how they got on. Once trained, the estimated total commitment is around 2-3 hours per week.